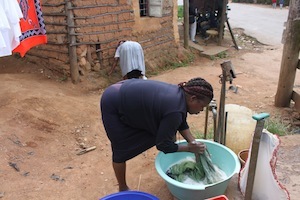 MBABANE , Mar 18 2012 (IPS) - Margaret Gamedze earns a living doing laundry for people in her community in Msunduza Township, which lies about a kilometre outside Swaziland’s capital city of Mbabane. But since the country’s fiscal crisis began, she no longer earns enough to pay the rent for her one-roomed mud shack, which she shares with her five children. Since last year, her income declined from about 130 dollars to only 50 dollars a month. From that she has to pay a monthly rent of 35 dollars, and not much remains from this to buy food and other basic necessities. “Most people I approach for employment complain that they don’t have money because they have lost their jobs or the government has not paid those who are operating their own businesses,” said Gamedze. A fiscal crisis hit the country in 2010 after revenue from the Southern African Customs Union was reduced by almost 60 percent. Gamedze’s income was radically reduced and four of her five children dropped out of school. A United Nations Impact of the Fiscal Crisis in Swaziland survey released on Mar. 16 said that 21.9 percent of surveyed households have experienced reduced income. About seven percent of households surveyed admitted to having a member who lost a job. Gamedze is not the only one affected by the financial crisis because many of her neighbours in Msunduza Township are idling at home after losing their jobs. “I was retrenched from a construction company after the government ran out of funds to continue with capital projects last year,” said Mancoba Gama, 32, as he sat in the township drinking the local brew. He added that he and others have given up on finding a job because prospective employers have turned them down on too many occasions. The financial crisis has added to the unemployment strain in the country, which stands at 52 percent among the youth. According to the United Nations Development Programme’s economic advisor Zuzana Brixiova, almost half of the surveyed households depend on formal employment for their income and they were severely impacted during the fiscal crisis. People, especially those in the private sector, were retrenched or had their wages reduced last year while some small business operators closed down. As a result, the main challenge that 23.9 percent of the surveyed households complained that they faced are the high food prices. The inflation rate now stands at 9.43 percent and it has become even more difficult for the 63 percent of Swazis living below the poverty line of two dollars a day to put food on the table. The price of commodities, including paraffin, and other basic foods such as oil, maize meal and bread, has increased. And this means that Gamedze can only afford one meal a day. Clement Dlamini, a training consultant, said the dependency of most households on formal employment is an indication that the country was training jobseekers rather than entrepreneurs. “This is a challenge to training institutions to come up with programmes to assist the youth with entrepreneurship skills and business management,” said Dlamini. Dlamini also called upon government to address the issue of access to land. Many Swazi people do not own the traditional land on which they live and hence banks cannot consider it as collateral when people apply for loans. However, deputy president of the Trade Union Congress of Swaziland, Sibongile Mazibuko, challenged development partners to refrain from funding the government’s social expenditure while authorities continue to be wasteful. She said it is unfair for the government to keep attempting to cut the country’s civil servant’s wage bill. However, the wage bill is the second largest in the region at 18 percent of GDP. The Swazi government is proposing a 4.5 percent salary cut for public servants as well as freezing annual salary increases in an effort to reduce the wage bill by five percent. “What about the over-expenditure at the army and traditional events that do not benefit us such as the Marula Ceremony?” asked Mazibuko. King Mswati III and the Queen Mother, Ntombi Thwala, join throngs of women in song and dance on two separate occasions in the month of February. This is to commemorate the marula season and government funds these events. However, the cost of the festivals are not publically known. She said it does not help the country when cooperating partners like the European Union (EU) pay for basic national services without forcing government to exercise fiscal discipline. This year the EU will pay for first graders under the Free Primary Education Programme until 2014. Only one of Gamedze’s five children continues to attend school, as he is a beneficiary of the Orphans and Vulnerable Children Fund, a government project. Last year, government ran out of money and could not pay the fees on time for beneficiaries of the fund and for those who benefit from the Free Primary Education Programme. “On several occasions my son was sent back home from school because the principal said I should pay his fees because government had not honoured its obligations,” said Gamedze. Government finally paid the fees after borrowing money from financial institutions, but that was just enough to pay public wages and social grants for the elderly. Swaziland entered the crises with existing economic and social problems, including an unemployment rate of 29 percent of the labour force while 29 percent of the population is food insecure, according to the survey. The country is also leading the world with the highest HIV/AIDS prevalence, at 26 percent of the productive age group according to the 2007 Swaziland Demographic Health Survey, showing an additional strain from the fiscal crisis to an already desperate situation. Minister of Finance Majozi Sithole said poor people were neglected when the impact of the fiscal crisis was reported. “Everyone concentrated on the impact on businesses, banks and even the lilangeni/rand parity, while not paying attention to poor households and how they were coping under the economic crisis,” said Sithole. “Swaziland needs international assistance including the continued support of the international community, private sector, U.N. agencies and NGOs,” acting U.N. resident representative Dr. Jamab Gulaid said on Mar. 16.